1. Buy a universal stroller sun cover. We like this one from Jolly Jumper. At $14.99 it is much more affordable than most brand name stroller specific covers. Plus the universal covers can also be used on playpens, carriers and umbrella strollers. 2. Use a stroller sun cover. 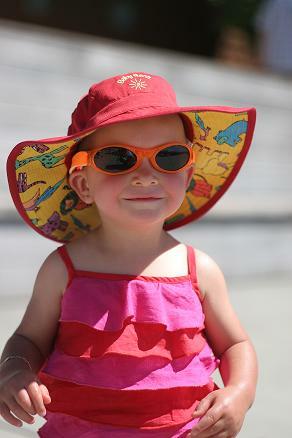 If you use a sun cover, you do not need to use sunscreen as often. 3. Dress baby in light weight, breathable long sleeved tops, long pants, socks and a hat. All that's left to slather is from the neck up. 4. Invest in safe sunscreen. Read the EWG (Skin Deep)'s 2012 Sunscreen Report here.